Today’s the next instalment in my #TipTuesday series. 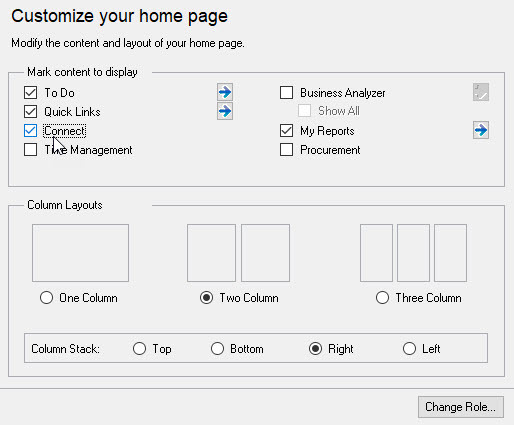 This tip is about the home page in Dynamics GP. Wouldn’t you know it? I was trying to think of what I was going to write about for today’s post and a user had an issue with their home page. It was stuck. They couldn’t add or change the panes in it anymore, and the one pane that was visible was maximized without the little icon to shrink it back to normal size. I’ve seen this at other clients too from time to time and have no idea what causes this, but it’s random and annoying! Here are a couple of ways to fix this issue. Here’s a mockup of the issue to illustrate the problem we had with a user and what I’ve seen elsewhere. Here’s a screenshot of my home page, one pane (shrunk for the sake of screenshots). In the picture here, you can see the button beside the blue help button, where I could shrink this window back down to normal size. In my user’s case today, that was missing, it was stuck full size with no obvious way to reset the window. That’s one example of an issue people have with the home page that requires a reset. The second, and I believe more common issue, is a user will go into Customize This Page, the window is shown below, and mark off what content to display but they click OK and the changes are not saved. That’s the 2nd example and the one I’ve seen most often, in all versions of GP. The first option and my preference is the one that requires no back-end messing around and the user can do this themselves. It’s simply to change their home page role to try to “reset” the page. It doesn’t really matter if you choose the same default role you had in the past, at least in my testing, but changing the role triggers some sort of re-write in the home page settings and usually fixes the issue. The downside of this option is the user will lose any previous home page customizations they have set up. Their quick links will be gone, etc. most times. 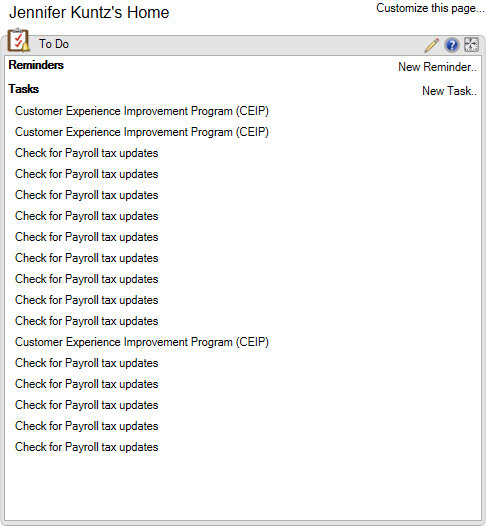 I say most times as in our case, some things did not disappear (the custom reminders my user had were still there), but all of the default items appeared back for whatever role the user chooses. To change roles, first, click on the Customize this Page link on the homepage (the screenshot above), and click on Change Role at the bottom. First, the user will have to acknowledge a warning message that their customizations will disappear. 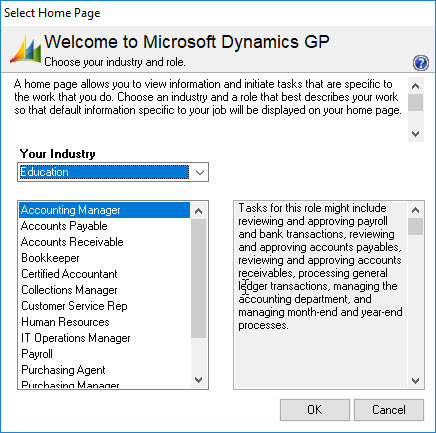 Once they acknowledge that, the Welcome to Dynamics GP window comes back up and the user can re-select a role that is appropriate for them. There is a Dynamics Community question from a few years ago where some scripts were discussed. Near the bottom of page 1, Jonathan Fear wrote an answer with some script options to try. I can confirm that in my LIMITED testing (that’s the important part to note on this one! ), I played with just the DELETE script to remove my own settings and when I logged back into GP, it did bring back the default home page for whatever role I had selected when I first logged in (a long time ago). Someone in one of the comments alluded to that, that deleting and having the user log back in may, in fact, be sufficient to fix the issue. Please test thoroughly if you want to script something though… the table Jonathan is referencing is the SY08100 table, Home Page Layout, in DYNAMICS. There are several tables relating to the home page, SY08000 through SY08140. Each one has a different portion of it but not all of the home page items are in these tables. My Reports, for instance, are not stored in these tables. Whichever option you select, the best thing to do other than test in a test environment (not test company! ), is take screenshots of the settings that are visible and perhaps have someone run a script on the SY081XX tables to capture the settings from each table for that given user ID. At least with that information you have a way to recreate most of the contents if you need to manually do so, after resetting the home page.